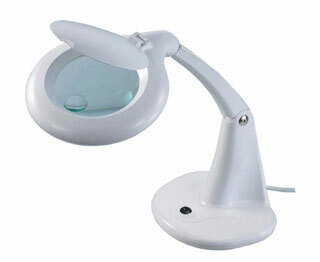 Magnifying desk lamps - Australia delivery. LED Magnifying Lamps lit with 60 diodes - delivered Australia wide. Features: Desk Magnifying Lamp model. 10 cm wide round Glass lens. Magnification is 3 dioptre (1.75 times). Small 12 dioptre (4 times) section inset into lens. Light source - 60 LED's. On / Off Light switch. Power rating - 240 volts, 50 Hz, 12 watt. LED Lights have a life expectancy of up to 10,000 hours. Other Lamps and Magnifiers with Lights. with Light on a sturdy stable Stand on wheels. on a Stand with 5 legs for sturdy support. CAPG004W Magnifier with Lights and large Glass Lens plus Stand. CAPG005 Portable Magnifiers with Light. The Lamps in these Magnifiers come with a 12 watt globe. CAPG006B Bench Magnifiers with Light. Black Lamps with a 22 watt Fluorescent bulb and arm that is flexible and can be placed in almost any position. CAPG008B Black Magnifier with Light. Lamps are fitted with a 22 watt Bulb and Magnification is via a 5 dioptre round Glass Magnifying Lens.
. Lamps in these Magnifiers come with 22 watt round bulb and 5 dioptre Magnifying lens. A favourite with Beauty technicians and best selling model overall in our range. with Light. Includes a 5 dioptre Glass Lens with an additional small removable 12 dioptre Magnifying lens for more detailed inspections.
. These Magnifiers have a large rectangular 5 dioptre Glass Lens to enable easier inspection of larger areas. Frequently purchased by people wanting to do handicraft but suffering from macular degeneration. with Lights. LED Lighting consists of 108 LED Lights. LED life is up to 12 months of continuous use. 5 dioptre Glass Lens plus Bench mounting Bracket also included. CAPG041 Magnifiers with LED Lights comprising 108 Lights. LED life is up to 12 months of continuous use. This LED Lamp comes complete with Stand. CAPG070 Adjustable Magnifier with Lighting using a Fluorescent Lamp. They have a 5 dioptre Glass Lens (providing 2.25 times Magnification) plus have a heavy base for stability while sitting on your Desk. CAPG090 LED Magnifier. Lighting source is 90 LED diodes. Life expectancy of LED Lights is up to 10,000 hours. Modern sleek looking model with half the weight of the equivalent Fluorescent units. CAPG091 LED Magnifiers and white Stand with Lights using 90 LED diodes. Life expectancy of LED is up to 10,000 hours. CAPG001WL Replacement round Glass Lens for Magnifiers. 12.5 cm diameter. CAPG003WL Replacement rectangle Glass Lens for Magnifiers. Measures 18.75 x 15.5 cm. CAPG005L 12 watt Light Bulb that fits CAPG005 Lamps. Measures 14 cm in diameter. CAPG030B Black Stand for heavier Lamps. CAPG030W White Stand for heavier Lamps. CAPG031B Standard black Stand for Lamps. CAPG031W Standard white Stand for Lamps. CAPG050B Black Wall Bracket for mounting Mag Lamps. CAPG051B Heavy duty black Bracket for larger Magnifiers. Standard black bench Bracket for supporting Magnifiers. CAPG052W Standard white bench mounted Clamp. CAPG053 9 watt Light Bulb. Connection is through 2 pins. CAPG053A 9 watt Light Bulb. Connection is through 4 pins. CAPG054 22 watt Light Bulb fits CAPG008 Lamps. Measurement of outside diameter is 20.75 cm. CAPG056 28 watt Light Bulb - fits CAPG010 Lamp. CAPG057B Black mount insert for Desk Lamps. CAPG057W White mount insert for Desk Lamps. Magnifying Lamps delivered Australia wide. Online payments with MasterCard, Visa or PayPal. Payments also accepted via internet banking or cheque. * Desk top, Table, Floor Stand, Portable and LED models available. * All Magnifiers and spare parts can be inspected at our Canberra store.